Retailers should be in retention mode, not giving up hope or fighting to win back what they haven’t yet lost. 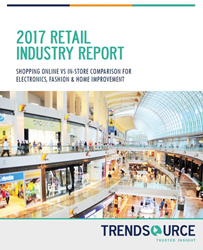 TrendSource’s 2017 Industry Retail Report tells us that shoppers have already largely determined which experience offers better availability of products and variety of selection (online), and which offers superior customer service and ease of returns (in-store). One place where they have yet to decide, however, is pricing. While 62% of respondents believe pricing is better online, respondents were almost evenly split between brick-and-mortar and online when it comes to pricing for fashion and home improvement. The report offers more good news for traditional retailers: Millennials, who were supposed to be the death of brick-and-mortar retail still prefer in-store shopping experiences over online. In fact, every generation still prefers in-store shopping for fashion (73%), electronics (66%), and home improvement (76%). What is bringing shoppers in-store? In all three categories, immediacy was king: “Getting the items immediately” drive 85%, 83%, and 88% of shoppers to brick-and-mortar electronics, fashion, and home improvement stores, respectively.